Top That! : Kianti's Justin Wadstein stretches pizza making to the limit. Sometimes, something comes forth from a politician's mouth that sounds like manna from heaven to his political opponents, who listen in glee-struck awe as he willingly and unceremoniously puts his foot in his mouth. This time it was Mayor MIKE ROTKIN, who, after the WESTERN HOTEL PROPERTIES pulled out of the conference center plans, told the Sentinel, "I think it's a devastating blow for the city. ... Frankly, I can't wait for some of the opponents to get in front of us at budget time and ask for stuff. I think it's very sad." Much to Rotkin's dismay--and his opponents' delight--the quote has been making the rounds. At least one local gadfly hopes to juice Rotkin's one-liner for all it's worth as rumors of a recall buzz around like so many, er, gadflies. Such efforts wouldn't be the first that Rotkin's weathered--he recalls two other attempts that never got off the ground--and one that did. The successful attempt was led by conservative KSCO talk show host STEVE HARTMAN, who went to the trouble of getting thousands of signatures and taking out a full-page ad in the Sentinel to take Rotkin down. Hartman promised to leave town if the recall failed, and has since made good on that promise, moving up to Lincoln, Mont., widely known as the former home of the UNABOMBER. Reached by phone, Hartman denies any such attempt. "I would never recall Mike Rotkin! He's the only conservative we've got in Santa Cruz!" Ironically, Hartman offers words of support for former Mayor SCOTT KENNEDY (who initiated negotiations for a conference center at the Coast Hotel) and for Rotkin. "There was one time," says Hartman, "when Mike Rotkin was probably the most anti-business person in this community, and he used [UCSC's] community studies department to create a utopia in this community. But he finally got it--that it takes revenue to attempt to create utopia, and without revenue all you get is a lot anger in the community. ... Of all the progressives, this is the guy that finally got to reality." Meanwhile, the reality of a $700,000 budget shortfall has caused some spirited words to be bandied about, including Rotkin's. "I think the right phrase is, I misspoke," says Rotkin. "The implication would be that I'd treat people differently depending on what their views were on some issue like the conference center, and that is far from the truth. I was really expressing an irony, that basically when people show up, it doesn't matter if they were for or against the hotel--we're not going to have any money to fund things that people typically might be asking for. So I think the people that played some role in limiting the city's revenue sources are in a somewhat contradictory position around that issue, but it was not in any way to suggest that I would punish people by withholding money from them depending on what their views were and shift the money in favor of people who voted in favor of the Coast Hotel. We have no money to shift anyway--everybody's going to suffer from the city not having money." "I hope people have better things to do with their time than try and recall me." Anyone who's been to KIANTI'S downtown on a Friday or Saturday night has seen the staff's festive little dance show, the star of which is 19-year-old JUSTIN WADSTEIN, who juggles two twirling disks of dough in front of a towering wall of fire. But few had the chance to see him actually compete in the WORLD PIZZA GAMES at the INTERNATIONAL PIZZA EXPO in Vegas, where he proved his acrobatic pizza-tossing prowess by finishing first in the United States and fourth in the world. A six-year veteran of pizza-tossing, Wadstein not only juggles the pies, he rolls them off his shoulders and arms and spins them between his legs and around his back; he can toss them blindfolded, does breakdancing-inspired tricks on the ground and--as long as he's not going to use the dough for customers--he can even spin them on and off his feet. 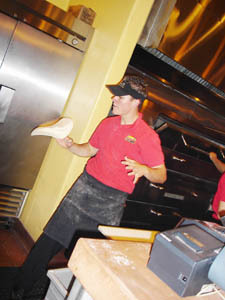 Pizza-tossing routines are judged not only for the difficulty of the tricks, but also for their choreography and rhythm--components which Wadstein practiced for only three weeks prior to the competition. The U.S. WORLD PIZZA CHAMPIONS have made Wadstein an honorary member for his skills, which means they'll be flying him to Chicago and New York for more competitions, plus a trip to Italy next March to compete in the biggest contest of its kind, which will be broadcast on the FOOD CHANNEL. In the meantime, you can catch him locally behind the counter at Kianti's on Fridays and Saturdays at 7pm and 9pm on the dot. Two weeks ago, Nüz helped spread the word about the EMERGENCY SIT-IN at the CESAR CHAVEZ PUBLIC LIBRARY benefiting the cash-strapped SALINAS PUBLIC LIBRARY SYSTEM. Just in time for NATIONAL LIBRARY WEEK, a public awareness and appreciation effort spanning April 18-24 sponsored by the AMERICAN LIBRARY ASSOCIATION, Salinas Mayor ANNA CABALLERO happily reported to the NEW YORK TIMES that the $500,000 fundraising goal was reached, meaning that, at least through the end of the year, the libraries in Salinas will stay open for about one day a week. As of press time, BILL MURRAY hasn't responded to Nüz's inquiries about topping off his $12,500 donation, but efforts to restore funding via help from the governor or through a bond measure continue. With the help of the City Council, the COALITION FOR LIMITING UNIVERSITY EXPANSION (CLUE) have already turned UCSC'S LRDP into the proverbial kind of four-letter acronym. Now they're taking their grievances directly to some of the folks who might make the plan possible--UCSC alumni. CLUE folks will be up on campus demonstrating and handing out fliers at UCSC's main entrance this Saturday, which also happens to be UCSC Alumni Day. To the alumni who actually give a damn, Nüz would like to take this opportunity to recommend some alternative forms of transportation to and from campus that they can fund, starting with (a) eco-friendly horses shuttling students to campus through the Pogonip, (b) a student-a-pult that launches students from downtown up to a safety net on the East Field, and (c) genetically engineered talon-less giant eagles. Any of these will make getting to campus the funnest part of every student's day. From the April 13-20, 2005 issue of Metro Santa Cruz.